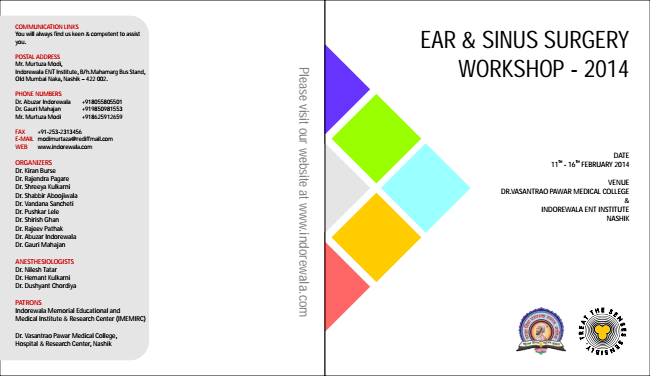 Otolaryngology Update: Ear & Sinus Surgery Workshop, 2014 to be held between 13-16 Feb 2014 at Indorewala ENT Instittue, Nashik. Ear & Sinus Surgery Workshop, 2014 to be held between 13-16 Feb 2014 at Indorewala ENT Instittue, Nashik. Already registered for 40 Temporal Bone Hands on Cadaveric Dissection. 10 Seats Vacant for Basic Sinus Hands on Cadaveric Dissection begening from 13-16 Feb 2014. Please post here or call Mr.Murtuza Modi at 08625912659 for further details.